Thanks for your interest in the Auburn University Marching Band. Membership in the AUMB is open to all full-time Auburn students, regardless of major. The following is an outline for prospective wind players, percussionists, and Tiger Eyes, which explains the entire process for joining the band. If you are new to the AUMB, read the AUMB General Information page so you are familiar with the general operation of the band. If you will be a freshman in the fall, apply and be accepted to Auburn University and receive your AU Username and Password. Register for the AUMB Membership Database, or update your existing profile, using your AU Username and Password. On your profile, mark your intent to participate in Marching Band in the fall. You should ONLY mark your intent to participate in Marching Band if you will be attending and auditioning for the AUMB during that year’s Preseason Camp. Register for the Marching Band class (MUSE 1100) during your summer Camp War Eagle session or during your assigned registration session. The course is one credit hour and all members of the band must be registered for the course. Report to the AUMB Preseason Camp during your assigned registration time. Everyone who is interested in participating is invited to the camp. Periodically check the Auburn Band website throughout the spring and summer for updates on the upcoming camp. Students will complete a playing audition and a marching evaluation at the start of the camp afterwhich final membership of the band will be announced. Playing audition material consists of music from the first halftime show and from the AUMB Pregame show. This music will be posted online before camp begins. Students should print and prepare the part for which they would like to audition. 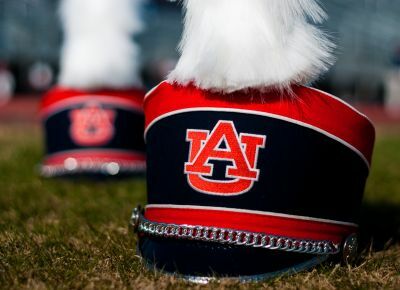 In most instances, students that have participated successfully in a high school marching band program and/or in a college marching band are successful in our auditions and become members of the Auburn University Marching Band. Register for the AUMB Membership Database, or update your existing profile, using your AU Username and Password. On your profile, mark your intent to participate in Marching Band in the fall. You should ONLY mark your intent to participate in Marching Band if you will be attending and auditioning for the AUMB Drumline during that year’s AUMB Drumline and Front Ensemble Audition Camp. Register for the Marching Band class (MUSE 1100) and Percussion Sectional Class (MUSE 1610) during your summer Camp War Eagle session or during your assigned registration session. Each course is worth one credit hour and all percussion members of the band must be registered for both courses. Audition for the AUMB Drumline and Front Ensemble during the June audition camp. Details on the camp can be found in the audition materials on the Drumline page. Those who pass the May auditions should report in early August for the second round of auditions, which take place immediately prior to Preseason Camp. Report to the AUMB Preseason Camp during your assigned registration time. If you will be a freshman in the fall, apply and be accepted to Auburn University as a full-time student. If you are already an Auburn student, you must have a GPA of 2.0 or better. You may attend our optional Tiger Eyes Audition Clinic, typically held in late February. This clinic is recommended for new auditionees, in order to prepare for the auditioning process. Visit the Tiger Eyes page for details on each year's clinics. Audition at the appropriate time during the spring audition. For more details, please visit the Tiger Eyes page. Register for the AUMB Membership Database, or update your existing profile, using your AU Username and Password. On your profile, mark your intent to participate in Marching Band in the fall. If you are successful during auditions, register for the Marching Band class (MUSE 1100) during your summer Camp War Eagle session or during your assigned registration session. The course is one credit hour and all members of the band must be registered for the course. In addition, you most also sign up for the Tiger Eyes Sectional class (MUSE 1620 ), which is worth an additional hour of credit. Attend the Tiger Eyes summer mini camp. Report to the AUMB Preseason Camp during your assigned registration time. Periodically check the Auburn Band website throughout the spring and summer for updates on the upcoming camp.